When I was a little girl, I used to try on my mother’s shoes. I wanted to know what it felt like. To be honest, it never felt particularly good. Her shoes were always too big, too uncomfortable, too difficult to walk in. 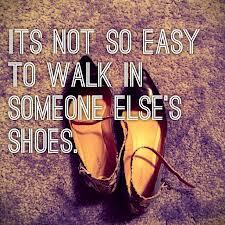 I came to the conclusion that it’s not easy to stand in someone else’s shoes. My shoes always felt best. And then I grew up, and realized there was another meaning to being in someone else’s shoes. Not a literal one but a figurative one. But my conclusion was the same. It’s not familiar, it hurts. It’s not supposed to feel comfortable. Even if we’ve been through something similar in our own lives, it’s never quite the same. Everyone’s experience is unique. We could all use a healthy dose of empathy. At times, we all need a healthy dose of empathy. True empathy makes a huge difference. 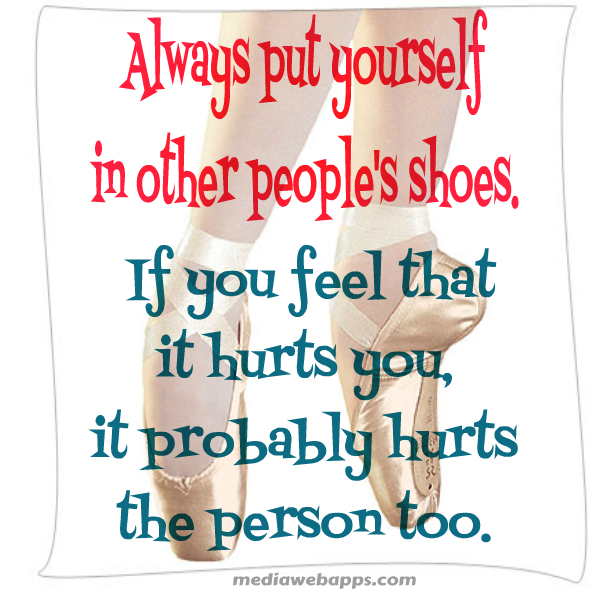 It might not change a situation, mend a hurt, or even provide an answer but it makes all the difference to know that someone else is willing to go through the discomfort of being in your shoes so you don’t have to walk through the tough stuff alone. There’s a saying that you shouldn’t judge or criticize someone until you’ve walked a mile in their shoes. It’s a reminder that we can never really know exactly what someone else is going through. But, if we were able to make it even a fraction of a mile in someone else’s shoes, perhaps we’d begin to see things from their perspective. It doesn’t mean we’d always like it or agree with it or even fully understand it. But we’d see it through their eyes. I like shoes. I like wearing my shoes. 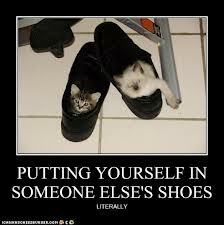 But, I want to be the person who is quick to step into someone else’s shoes, to see life from their perspective. Maybe even make a difference in the process. Have you ever thought about naming a new year? Me neither… until today, when I read a friend’s blog about naming a new year, which then becomes your theme for the year. That idea intrigued me. What I’ve decided is that 2013 is going to be the year of “transparency” (not to be confused with “invisibility”). The definition of transparency I like best is “made visible by light shining through from behind”. But, I’m going to ‘joy’ify that definition to say “made visible by light shining through from above“. I really believe the world needs more transparency. There’s so much secrecy, shame, guilt, regret, anguish, mental torture, despair, and hopelessness in people’s lives. So much darkness. All the more reason to shine a little light their way. Nothing cuts through darkness like light. And light brings hope. That being said, I’m not talking about reckless transparency. We all know people who are way too transparent. People who have no filter. It’s like transparency for transparency’s sake. The kind of transparency I’m talking about is prudent transparency. 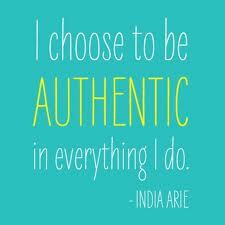 There’s a time and place to be transparent, and it takes wisdom to know when that is. It’s transparency for a purpose. Not a self-serving purpose but an outward-serving purpose. A purpose that encourages, builds up, gives hope, lets someone know they’re not the only one, lets someone know you’ve been in their shoes and made it to the other side, lets someone know that the grace God has given you is available to everyone, including them. 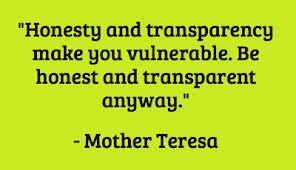 It’s not easy being transparent because it makes you vulnerable, and no one likes to be vulnerable. People like to judge. My response to that is people who live in glass houses shouldn’t throw stones. Or, in Jesus’ words, “let he who is without sin cast the first stone”. I believe that, if I’m intentional and prudent about how and when I’m transparent, I’ll make a difference in people’s lives. That others will see how God has worked through my negatives to make me stronger, and be encouraged. Themes like a good idea to me.